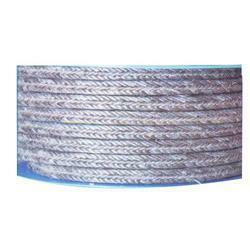 We are a leading Exporter of packing carbon yarn from Ahmedabad, India. Our organization is among the reputed names in the industry for supplying and trading Packing Carbon Yarn. The offered yarn is made from high -grade materials in a sophisticated production facility. It is used for packing valves in the chemical industry and thermal power plants. This yarn is known for its high resistivity towards chemicals, thermal stability and high tensile strength. Looking for Packing Yarn ?